The fellow in the tie is Mr. Tyler and Grandpa's name was Lon Weaver. Can you tell me what the type of this engine is? The only information is on the back of the photo is "Dad & Mr. Tyler". Dad being Alonzo Weaver. I have a newspaper clipping of his retirement, Grandpa, which was as close as I can tell in 1941. The newspaper clipping has the header missing and little other information. I will send the clipping or rather a copy of the clipping to you. My childhood memories involve walking with grandpa to the Belmont Yards on the West side of Indianapolis. There was a heavy repair shop on the west side of Belmont along with a switch yard, and across the street, Belmont Ave, a round house. I remember seeing the workers replacing a tire on a drive wheel and the lathe truing the wheel afterward. Sometimes we would ride on the street cars to Beech Grove repair shop to see some of grandpas cronies. At other times, he and I would go to Union Station and with his pass ride a passenger to Effingham, ILL, then lay over to catch a freight back home. I rode in the caboose. Grandpa and his neighbor, Mr. Boshane, would argue over the merits of the Pennsy and stoker feed engines and grandpas fireman feed engine. Mr. Boshane had an Iron Fire stoker in his basement and grandpa had a shovel feed Victor furnace in his basement. As you pointed out, the gentleman in the tie is Mr. Tyler and Alonzo Weaver is the engineer. The photo was probably taken at Belmont Yard on the west side of Indy. 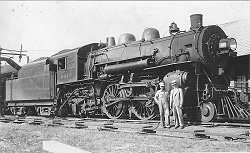 It was an Atlantic type locomotive build by Brooks in 1901 for the Big Four. 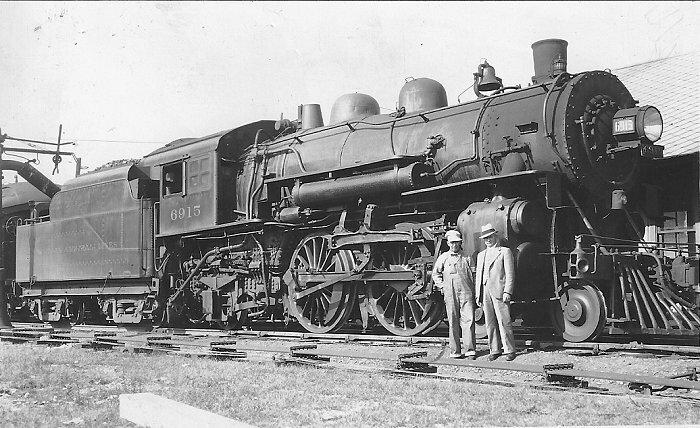 It was Superheated and had Stephenson valve gear when built. In the photo, it has been converted to Baker valve gear.